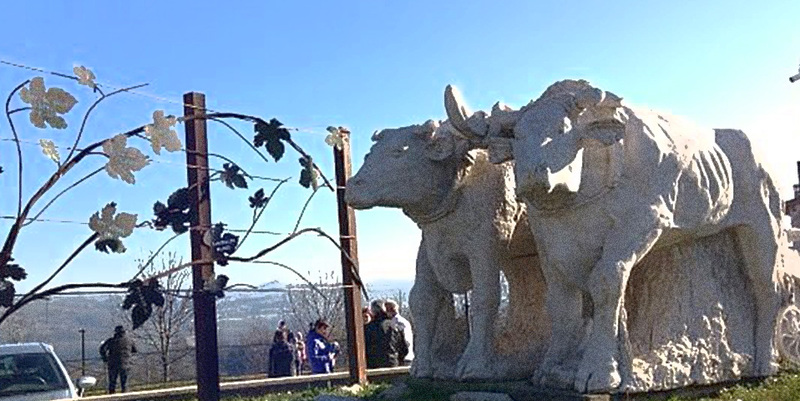 The Consortium for the Promotion, the Valuing and the Protection of the Fat Ox from Carrù, more briefly called Consortium for the Protection of the Fax Ox from Carrù, was born on 21st November 2014 on the initiative of the farmers Gianfranco Allione Cardone, Giovanni Rocca, Renato Cogno and Claudio Bottero from Carrù, together with their colleagues Sebastiano Gallo from Clavesana, Gianfranco Tealdi from Mondovì and Dario Porta from Bastia Mondovì, who decided to join together and adhere to the Consortium's Statute. Doctor Giovanni Comino, professional veterinarian with long and solid experience, once director of the ASL CN 1 veterinary clinic and true expert on the Piedmontese breed cattle, was appointed as promoter-associate of the Consortium, as well as its First President. Also doctor Stefania Ieriti, pro tempore mayor of Carrù, was appointed as promoter-associate of the Consortium as a sign of respect and gratitude, since she played an essential leading and linking role during the constitution of the Consortium. The founder-associates and the promoter-associates constitute the first Board of Directors of the Consortium for the Protection of the Fax Ox from Carrù. They will remain in charge until 31.12.2015. The ordinary associates are the single and associated farmers of the Fat Ox with I.A.P. (Imprenditore Agricolo Professionale) qualification who are regularly affiliated to the social security of the farmers and ask to become members of the Consortium, in compliance with the provisions laid down in its statute. To apply for admission it is necessary to fill in the form “APPLICATION FOR ADMISSION OF ORDINARY ASSOCIATE/MEMBER”. The annual membership fee to the Consortium must be paid in compliance with the provisions laid down in its statute and following all that is indicated as “TERMS OF PAYMENT OF THE MEMBERSHIP FEE”. The Consortium's promoter-associates are the public and private entities who are part of the supply chain of the product “Fat Ox from Carrù” and, since they share the goals of its statute, they commit to support economically the events and expenses of the Consortium through a yearly fee established by its Board of Directors. To apply for admission it is necessary to fill in the form “APPLICATION FOR ADMISSION OF PROMOTER-ASSOCIATE”. The honorary associates of the Consortium are local, provincial, regional, national and international institutions who support the development of the Consortium and its activities by promoting the assignment and payment of annual subsidies, as well as the natural people and/or the legal subjects who have gained benefits from the Consortium and possible other people who contribute to the development, the valuing and the promotion of the Fat Ox from Carrù through their expertise and interest. We define as "Fat Ox from Carrù” the Piedmontese adult castrated bovine bred in the areas and according to the procedures established by the production Regulation approved by the Consortium's Board of Directors during the meeting held on 27 December 2014. The main goal of the Consortium is to qualify, to protect, to promote and to value the Fat Ox from Carrù, by enhancing its breeding, its production, its marketing and its consumption. Its other goals are: – planning and implementation of all promotional and advertising actions aimed at encouraging the increase in consumption of the meat of the Fat Ox from Carrù; - planning and organising all promotional and advertising actions in order to help increase the consumption of the meat of the Fat Ox from Carrù; – putting in place all useful actions to enhance and improve the annual Fair of the Fat Ox from Carrù; –	a careful monitoring activity on the breeding, the slaughter, the marketing of the beef meat protected by the Consortium, on the use of the brand and/or appellation of the Consortium, also with the help of public boards of control, in order to prevent, avoid and repress abuses or irregularities which may damage the protected product, the interests and the rights of the Consortium and its members, also using legal actions if necessary; for this purpose, the Consortium may entrust the Veterinary Services of the Piedmont Region and/or University Institutes and/or accredited third parties with the task of carrying out inspections on the entire supply chain in order to check their compliance with the regulations applied; - the promotion of any initiative useful for obtaining the protection and safeguard awards provided for by the EC Reg. 2081/92 and 2082/92 and their subsequent amendments and/or additions, and aimed at the implementation of voluntary system certifications on the basis of ISO 9000 regulations and subsequent amendments and additions, or products certifications based on specific production regulations; - the promotion of initiatives and/or services aimed at perfecting and improving the quality of the production, the processing and the marketing of the product protected by the Consortium; - the fulfilment of all tasks and activities that may be entrusted to the Consortium by the Public Authorities, as well as by other Bodies and Associations. The art. 2 of the Disciplinary of production of the Fax Ox from Carrù identifies, in an initial phase, the territorial extension of the Consortium. These are the Administrative Bodies of the Consortium: - the Associates’ Assembly: made up of ordinary associates and chaired by the President of the Board of Directors (or in his absence by a person designated by the Associates\' Assembly); - the Board of Directors consisting of minimum seven and maximum eleven members elected among the ordinary associates. Other members of the Board of Directors without right to vote are: - the delegate of the supporting associates, the mayor of Carrù or his delegate and a representative of the ASL - the competent veterinary service for the territory – the Executive Committee; - the President - the Board of Auditors - the Arbitration Committee. The creation of the Consortium for the Protection of the Fat Ox from Carrù was preceded by the important coordination activity carried out, at the will of the Municipal Administration of Carrù, by the Promotion Committee for the Creation of the Consortium for the Protection of the Fat Ox from Carrù, which completed his work by unanimously approving the draft of the Consortium Statute in the evening of 9th October 2014. The act of constitution of the Consortium was drawn up on Friday 21st November 2014 by the notary Dr. Vincenzo Pitino from Carrù in the Town Hall Palace of Carrù. The Consortium wishes to thank the Municipality of Carrù, the notary Vincenzo Pitino, the Agricultural Commission “Comizio Agrario” of Mondovì and the bank “Banca Alpi Marittime Credito Cooperativo di Carrù” for the cooperation and the commitment shown to the Consortium.